Our 2015 Arts & Sustainability Artists' Residency took the UN Sustainable Development Goals as a focus, exploring whether and how artists' practices might connect to sustainability and address climate change. In March 2015, we invited twelve artists of different disciplines to join us for our second Arts & Sustainability Artists’ Residency, as well as a museum/art conservator, a researcher, and a polymath who also works for Creative Scotland. The residency was structured around a weekend-long discussion on the extraordinary and ambitious Sustainable Development Goals proposed by a working group of the United Nations. These 17 goals have been hammered out over two years by 70 countries from both the developed and the developing world and if they are agreed by the UN in September will come into force on 1 January 2016, with the aim of achieving the goals by 2030. Although at first glance it might be difficult to see what these goals have to do with artistic practice, we were keen to collectively explore whether they could be connected, which goals held particular traction for the artists involved and how we might use them to develop future work . Building on last year’s residency we also worked more closely with Comar to deepen our understanding of the organisation and the context of Mull. 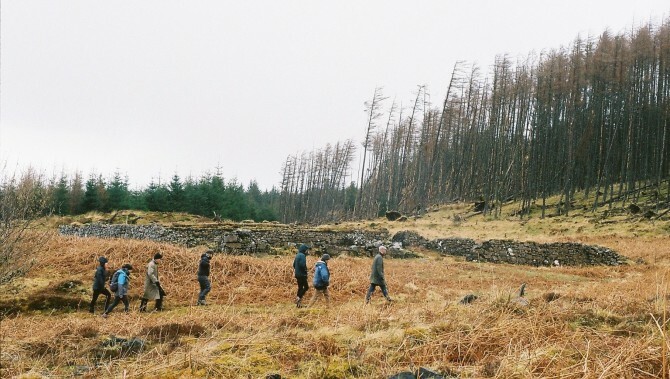 To collectively develop artists’, Creative Carbon Scotland’s and Comar’s thinking about how environmental sustainability can be engaged with in different artistic practices on practical and conceptual levels. To nurture and build a creative community of practice which embeds environmental sustainability at its core. Over the course of the weekend, our facilitator Mike Bonaventura from the Crichton Carbon Centre led us through different exercises to reflect on and discuss how we might engage with the SDGs through our individual or organisational practices. The ambition of the SDGs is no mean feat with the first goal reading ‘End poverty in all its forms everywhere’! Each SDG has more tangible and specific objectives attached, but nonetheless these are global and very high level aims. In spite of this, it became clear that each of us could see how the SDGs could affect us, how we could contribute to their achievement and how the arts and cultural sector could play its part. Read more about CCS Director, Ben Twist’s, reflections on the residency here. Download the full reading list of the 2015 residency here. Read the full Mull Report 2015 here.